Yamaha rear disc brake upgrade kit. This specific kit is designed to work with Yamaha gas and electric models from the G1 through the 2006 G22. This disc brake system will NOT work on any Yamaha DRIVE gas or electric models, also known as the the G-29. (The G-29 does not have any outer wheel brakes but rather has a wet brake inside the differential activated by a single brake cable.) If your Yamaha has cable activated rear drum brakes, this kit will fit The kit will work on a lifted or non-lifted cart. For some larger lifts, you may need to replace your driver's side brake cable with a passenger's side cable to gain the extra length needed to operate the calipers effectively. Smaller lifts may or may not require this upgrade. You've upgraded your golf cart, now upgrade your brakes. Standard brakes can't handle the stopping demands of many upgraded golf carts. If you add a rear seat or box, you've increased the weight of the cart which requires more time to stop. If you lift the cart and install larger tires, this too, will require more time to bring your cart to a stop. If you upgrade the power of your cart to increase the speed, it will take more time to stop from those speeds. If you've done all three, then your stock brakes are certainly not up to the task of safely bringing your cart to a stop. Ausco's Ameri-Torque caliper disc brake has the power to stop and hold better than the original equipment drum brakes...to last longer between pad changes...installs easier than other replacements. Made tough. Made to last. Made in America. This kit requires 10" wheels to be installed on your cart. To have better brakes, it requires a more robust and thus larger system. This kit will not fit inside an 8" wheel. There is simply not enough room. Please plan accordingly. Also note that not all 10" wheels will work either. Please read click "Related Documents" just below the price above to view the 10 Inch Wheel Service Bulletin to see a detailed explanation of which 10" wheels are not suitable for this application. Don't even take our word on the performance of this brake upgrade. Ausco Ameri-Torque brakes are quick and easy to install. Easy replacement with no drilling, welding, or modifications. Just bolt to existing holes. Installs with only simple hand tools. Uses existing cable system. Open design allows easy visual inspection and pad changes. This product is 100% made in the U.S.A. with high quality you can trust. They feature proprietary non-asbestos linings and are patent pending. Please click "Related Documents" just below the price above to view installation instructions and other pertinent information. Ausco Products uses 70 years or braking experience to design and build OEM brakes for construction, agricultural, mining, turf care, and utility vehicles for some of the largest manufacturers like: John Deere, Caterpillar, Toro, Polaris, Case Holland, and Agco, to name a few. 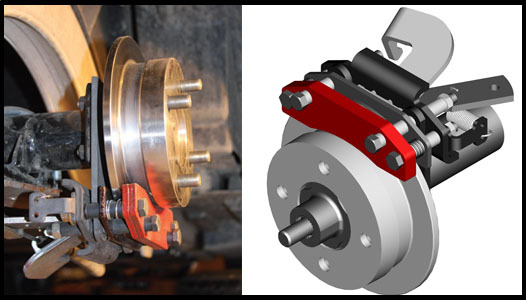 They produce the widest variety of service and parking brakes in the industry, including spring-applied multi-disc, hydraulic calipers, mechanical calipers, and ball ramp brakes. Trust the industry leader in off-highway braking to give your upgraded golf cart upgraded braking power and safety.